Expectations are such a funny thing. Of the two big new books launching from the Spider-office in February, Spider-Gwen, with the buzz generated from last year’s Edge of Spider-Verse #2 and its multiple variant covers, seemed to be a surefire, can’t miss hit, while Silk was being met with far more cynicism (from myself and others). When Silk #1 turned out to be a surprisingly solid comic, the stakes for Spider-Gwen #1 seemed to rise a notch higher. And would you believe it, while I’ve seen plenty of praise for last week’s Spider-Gwen debut issue (by Jason Latour and Robbi Rodriguez), there seems to be a fair bit of disappointment from fans who say the comic wasn’t … honestly I couldn’t tell you what fans who were let down were looking for because I don’t think any of them have verbalized it all that well. 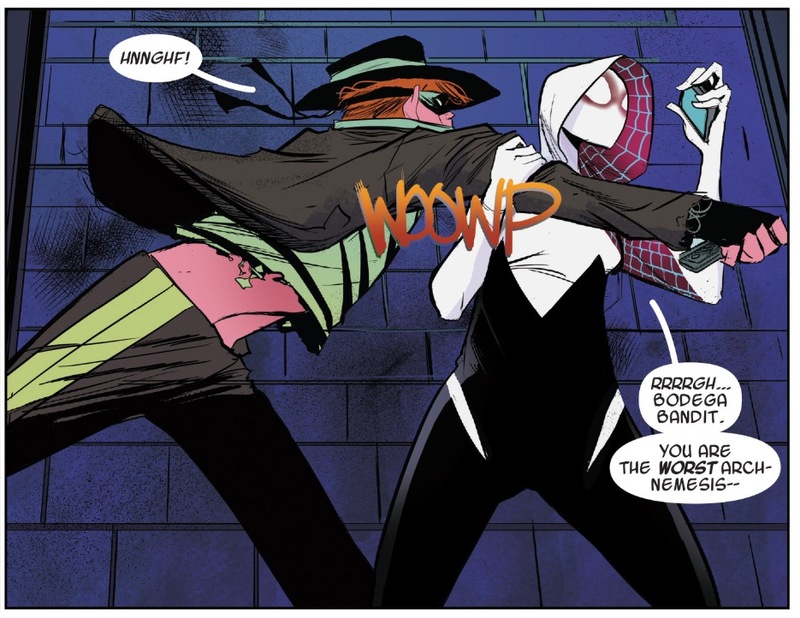 Before I go any further, let me just state upfront that I quite enjoyed Spider-Gwen #1, but in a completely different kind of way from how I loved the character’s debut in Edge of Spider-Verse. That’s due, in large part because Spider-Gwen #1 and Edge of Spider-Verse #2 were two completely different kinds of comics, with completely different missions and goals. One marked a one-shot opportunity to engage the reader with a totally unknown character iteration, and thus needed to throw everything it could in hopes of catching lighting in a bottle, and the other was the first step of what should hopefully be a long-term journey with this character and her wholly unique universe. It’s truly apples and oranges. After providing readers with a glimpse into Gwen’s world in Edge of Spider-Verse — including some interesting wrinkles like Matt Murdock (aka, Daredevil in the 616) being a crime boss and the Rhino being more of a hired goon than an actual guy in a gray rhinoceros suit — Latour and Rodriguez go far deeper in establishing all of the unique character dynamics and relationships Spider-Gwen has to offer. That includes, among others, Ben Grimm, beat cop from Yancey Street; Frank Castle the ultimate “bad copy;” and Adrien Toomes, the old, vain and bitter villain. In that regard, I think Spider-Gwen #1 is completely successful in its first attempt to introduce and flesh out the world it occupies. With each new character introduction, I found myself smiling along as Latour and Rodriguez put their own unique stamp on everyone and everything. Other alternative universe Spider-Man stories like Spider-Man: Noir and Spider-Man: India have introduced their own versions of beloved characters, but in many instances these felt like paint by number analogues of their 616 originals. For example, in these stories, you knew whoever was introduced as the Norman Osborn/Green Goblin character was going to be the main villain, and the Mary Jane/Gwen Stacy analogue would be the love interest. 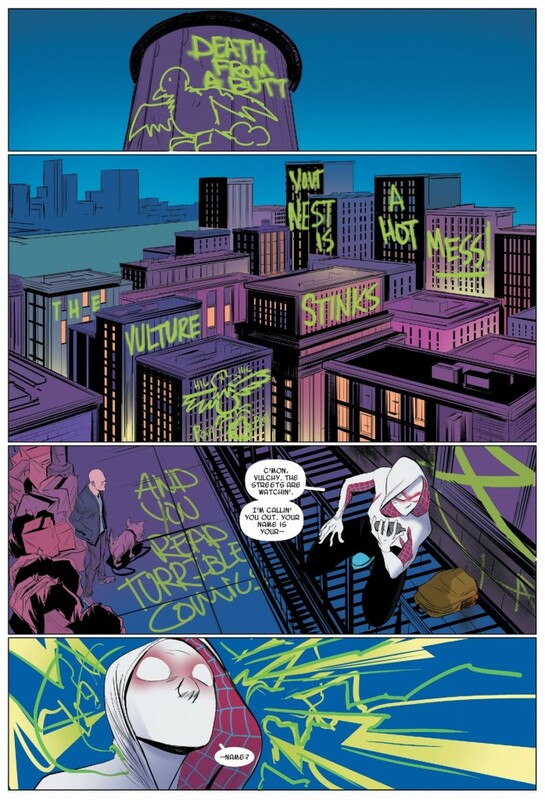 In Spider-Gwen, Latour and Rodriguez approach each of their characters with a little more adventure and intrigue. I found myself being curious about the backstory of the power-less Grimm or Castle the cop. I definitely want to see more of Murdock the criminal. Sure, the creative team doesn’t deliver on EVERY character introduction (Vulture still kinda feels like the Vulture with just a few new elements/subtle changes), but a defined and sound foundation is being laid for this series on every page of this comic. 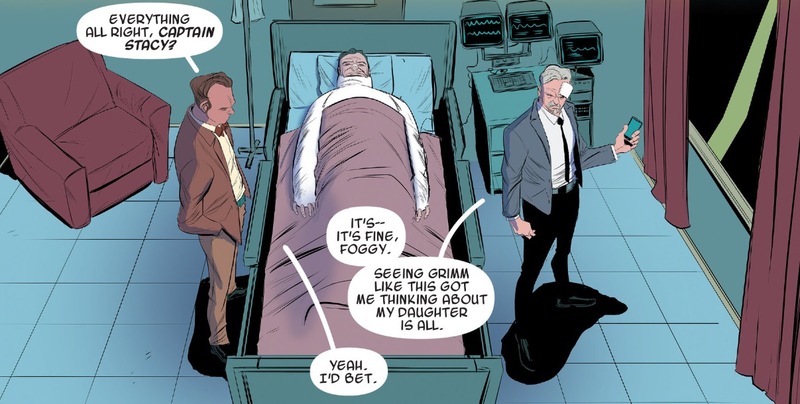 Of course, this comic’s biggest selling point — and the clear hook that makes this story different from just being an extended “What if?” exercise we get in so many other alternative world stories — is the relationship between Gwen and her police officer father. 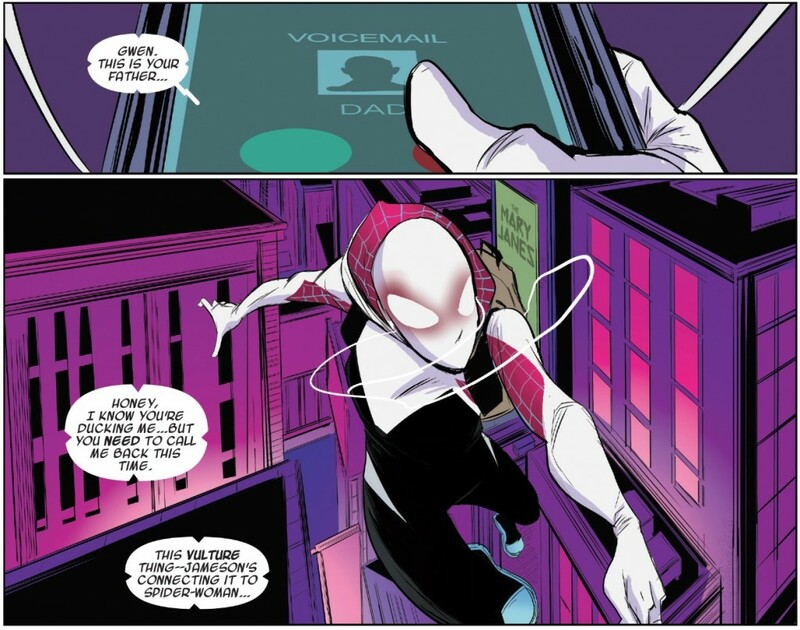 By having Gwen reveal her secret identity to her father upfront during Edge of Spider-Verse, Latour and Rodriguez and crafted a truly complex dynamic between these two characters. Gwen is afraid to go back home since she just told her dad that she’s secretly the masked vigilante that he has been charged with taking down, while Captain Stacy is reluctant to follow the orders of his commanding officer since he knows that Spider-Woman is his daughter (plus, Spider-Woman saved his life in Edge of Spider-Verse). By establishing this level of inter-character peril and drama at the onset, Latour and Rodriguez have opened up a number of storytelling possibilities for themselves. 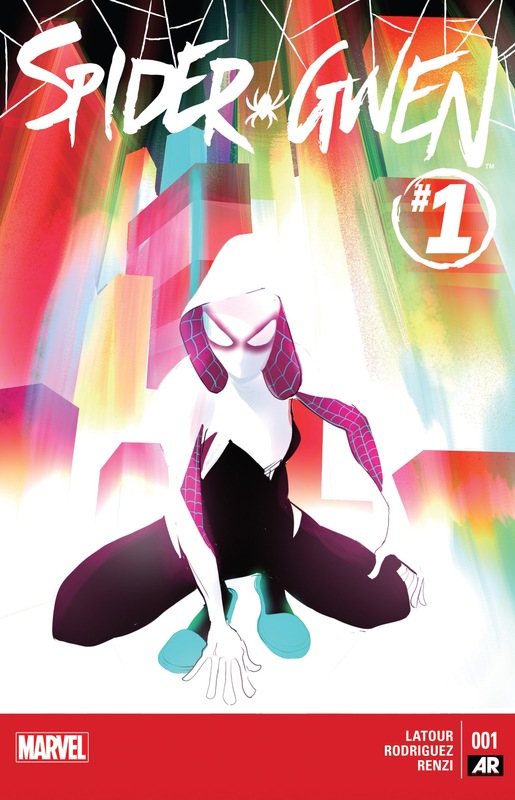 Spider-Gwen #1 isn’t a perfect comic, but it certainly is close to everything it needs to be for a series opener. To use a football analogy, in Edge of Spider-Verse #2, Latour and Rodriguez busted out a high risk/high reward play geared towards winning the game, while Spider-Gwen #1 feels more like a first quarter field goal in a game that appears to be a tight, back-and-forth affair where the winning team is the one that uses the clock efficiently and doesn’t leave points on the field. I guess if you look at it from that perspective, I can understand why some people were let down by the comic, but Latour and Rodriguez already convinced me of their ingenuity in Edge of Spider-Verse, so I’m more than willing to watch them play the long game with their characters and the Spider-Gwen universe. Reading your review, I’m likewise curious by the new wrinkles they’ve throw into our perceptions and epextiations of the main 616 versions. Kinda’ feels like Mutant X in the beginning, with all the possibilities and such huh? I hope this title does well, and could definitely wind up being the spiritual successor to Spider-Girl, inspiring the same amount of devotion to said character. I’m excited to spend time in this world. You’re right that there is definitely an “anything goes” expectation here that you don’t have as much of in books that are bound to 616. To quote what I wrote elsewhere about this issue, I’m really noticing the presence of authority figures in this world — Jameson as mayor, Frank Castle and Ben Grimm as cops, and, of course, Captain Stacy all contrast the more anarchic Spider-Woman (I refuse to call her Spider-Gwen. Ugh.). That works really well with the youthful-minded tone of the writing and the punk-ish art of the book. The tone agrees well with me, but I am left wondering if it is also part of the book being tailored to a certain age group, or, at least, a particular mindset. The reaction I’ve seen from some fans regarding the morality of her vandalism made me wonder that as well. Personally, I don’t mind it. Costumed vigilantes have always had seemingly-little respect for property laws. The one item that threw me a bit is that this really feels more like “Spider-Gwen #2” than #1. I skipped all the Spider-Verse tie-ins, figuring it’s be cheaper and more efficient to read them in trade form, and that includes SG’s first appearance. I’m probably in the minority on that one, but it did take me a bit to get a handle on everyone’s status and relation to each other. The initial book set up the world, and this issue introduced the complications. I can see how that may confuse people who have a preconception of what a first issues should do. Having said that, I love this book’s approach to its alternate continuity. If 616 Vulture works for the story, keep him as-is. If Frank Castle works better as a rogue police officer, use him as such. The mix of old and new elements of the mythos is a nice take, as opposed to being hidebound by a certain set of characterization or sequence of events. ….and people complained about the graffeti? Really? Sheesh, guys. I didn’t read Edge of Spider-Verse so this was my first taste of Spider-Gwen. While I think the book was put together well there just wasn’t anything that grabbed me and made me want to come back for more. I wanted to like it more than I did. Did you pick up on the Steve Ditko Mr. A burn?